Crow is a playful balancing posture, so while a sequence surrounding Crow should warm up specific physical areas in our bodies, it should also address the dedication, focus, and confidence it takes to balance on your hands. This means the yoga surrounding this pose needs to build those assets as much as it needs to build physically towards the peak pose. While it is fun to use shapes like Crow Pose, it is important to remember (and to impress upon ourselves and others) that our practice is not about lifting into the full shape. It is more about feeling the strength and the stretch in the build up to, and the release from, a posture. It is also about identifying the specific emotions that arise from that shape and learning about ourselves from that information. Arm balancing could bring up frustration or feelings of inadequacy -- it could also bring up feelings of freedom, focus, or playfulness... think about this as you build your sequence around Crow Pose. Most of the time remaining in the moment that feeds us before we enter the pose is much more educational then actually holding any pose like Crow. For example, the long and challenging Plank hold, or the split second of finding our balance before our toes lift up... this in itself can become a wonderful theme for a sequence built around Crow Pose. To physically build into any variation of Crow you need to fire up your inner thighs, core, and shoulders. Therefore any sequence where Crow is your peak pose should incorporate movements that ignite those areas, plus prep that encourages spinal rounding, arm strength, and deep Forward Folds. Take a few rounds of Cat/Cow. Pause in Cat for a little longer each time to really draw the navel all the way in and discover your core strength. From your last Cat Pose, pull your knee into your nose and lift up as high as you can, squeezing for 3 breaths. Repeat on the second side. Come up to Downward Facing Dog and after a brief hold, tip-toe your toes to the top of your mat to hold Rag Doll. Try to let all your doubts fall out of your head in a puddle leaving space in your mind for something new. Uncurl to standing with soft knees to take Mountain Pose, or for a slight back bend, then swan dive down and step back to hold a strong Plank Pose. Practice rocking forwards onto your toes and then back to explore compressing and opening the wrists while they are holding your weight. Come back to Down Dog and bring your right knee to your nose, lifting up on to your left tip toes as high as you can and drawing your navel all the way in. Balance for 3 breaths. Step your right foot forward and raise up to Warrior II, igniting your courage and your back inner leg muscles. Intentionally press your front knee out to the right to strengthen the interior thigh and to open the hip. Take this into Triangle to deepen all of those processes. Igniting your core, keep your breath smooth and seamless to wash out stress and frustration. Bending at the knees, step both feet forward to fold in half, and after 3 breaths find Chair Pose at the top of your mat. Leave a space between your knees so you know you are igniting the inner thighs as you squeeze them inwards. Decide to stay here for 3 breaths. Interlace your hands on your low back for Peddler's Posture, dropping your belly to your thighs and stretching out your shoulders by reaching your interlaced hands to the sky. Option to take this pose on your toes for more intensity, squeezing at the ankles (a.k.a Sparrow Pose). Come back to Chair and slowly lower into Boat. Hold any Boat variation for 30 seconds. Rock forward and step back to Down Dog. In Down Dog, spend a few breaths preparing for the second side. Then bring your left knee to your nose, rounding your spine to stand on your right tippy toes. Balance for 3 breaths before stepping the left foot forward for Warrior II and Triangle Pose. Come to Chair Pose at the top of your mat briefly to line you up for a deep Forward Fold. Hold this for 5-10 breaths, lifting your shoulders away from your ears and tilting your tail bone up. Your knees should be bent to encourage a tighter pelvic fold and more spinal lengthening. Now come into any variation of Crow Pose and hold for as long as your body feels strong and confident there. After a nice, juicy hold, step or shoot back to Chaturanga. Take a long, deep backbend like Cobra or Upward Facing Dog to stretch out your frontal plane and to reopen your chest. Slide back to Down Dog and playfully lift one leg for One-Legged Dog or Flip Dog to reopen the hips. Use this on both sides with an optional Vinyasa in between. Step both feet forward to Rag Doll and roll slowly up to Extended Mountain Pose with soft knees. Slide your hands to heart center and gently twist left then right in Mountain Pose. Having fun with sequencing is important. Keep varying it up and begin to entice a deeper hold by building in more strengthening activities as you go! If you are guiding other students, make sure to add in modifications for both advancing students and beginners so that everyone is comfortable and confident with your Crow Flow. 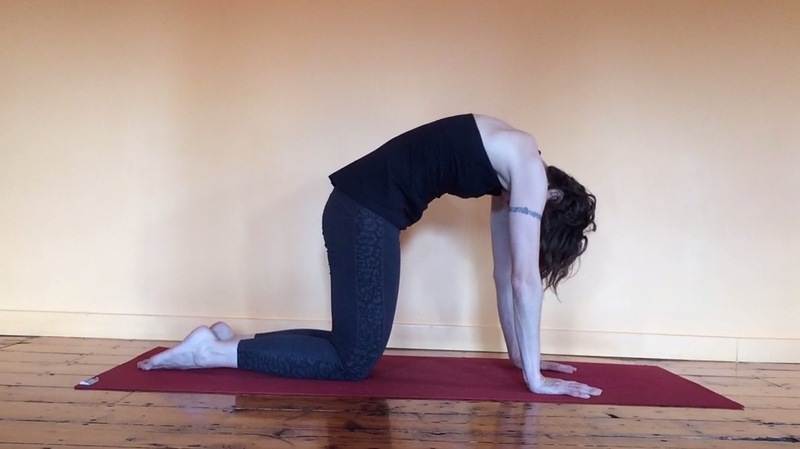 How do you like to sequence around Crow Pose? Share with us in the comments below!